Ford is slowly releasing more details on its new small truck due to enter production later this year. The 2019 Ford Ranger will make 270 hp and 310 lb-ft of torque from its turbocharged 2.3-liter four-cylinder, the automaker revealed today. The Ranger produces more torque than any other gas-powered midsize pickup truck on the market. That includes trucks with more robust V-6 engines. The V-6-powered Chevrolet Colorado maxes out at 275 lb-ft, while the V-6 Toyota Tacoma tops out at 265 lb-ft. 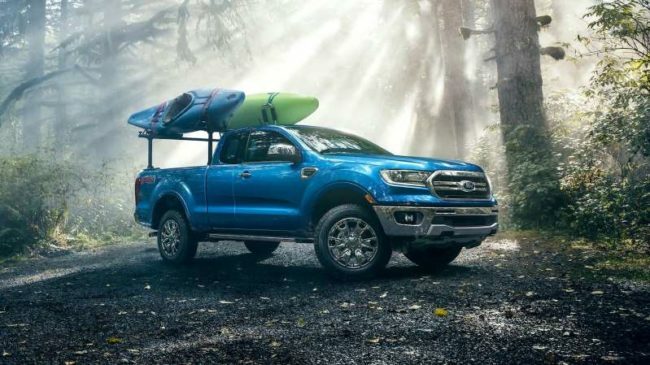 The Colorado diesel, however, pumps out 369 lb-ft.
At launch, the four-cylinder will be the only engine available on the Ranger here in the U.S. It’s unclear whether Ford will launch a diesel at a later date. All Rangers in our market come paired to a 10-speed automatic transmission. Ford also disclosed towing and payload numbers. When equipped with an optional tow package and a trailer brake controller, the Ranger has a maximum towing capacity of 7,500 pounds, more than any gas truck in its class. The gas-powered Colorado and Tacoma max out at 7,000 pounds and 6,800 pounds, respectively, although the diesel Colorado can haul up to 7,700 pounds. The Ranger’s maximum payload is 1,860 pounds, the highest rating of any current midsize pickup. As we previously reported, the 2019 Ford Ranger starts at $25,395. Although it won’t arrive in dealerships until early next year, the order books are already open. Three trim levels are available: XL, XLT, and Lariat.